My daughter decided that if she HAD to stay in Los Angeles for Independence Day, she would at least spend it with friends. She invited two of them for an overnight marathon of movies, junk food and board games. Ever last-minute, I decided we would be traditional and grill burgers for dinner. I queried the girls on their preferences. No. That wouldn’t be a problem anyway, as we have plenty of vegan burgers for my husband. But one of the girls likes yellow mustard on her burgers. This is a substance I do not usually stock in my fridge. Stupid question, right? But I still wasn’t sure how to go about celebrating July 4 in Los Angeles. The closest fireworks show is at a megachurch down the hill from one of the girls visiting. Last year’s event drew 60,000 people. I pointed him to the website, which clearly boasts attendance of 60,000. That didn’t sound promising. I’m not a big fan of hanging out in the hot sun with huge crowds of people, hours before the start of the actual fireworks show. 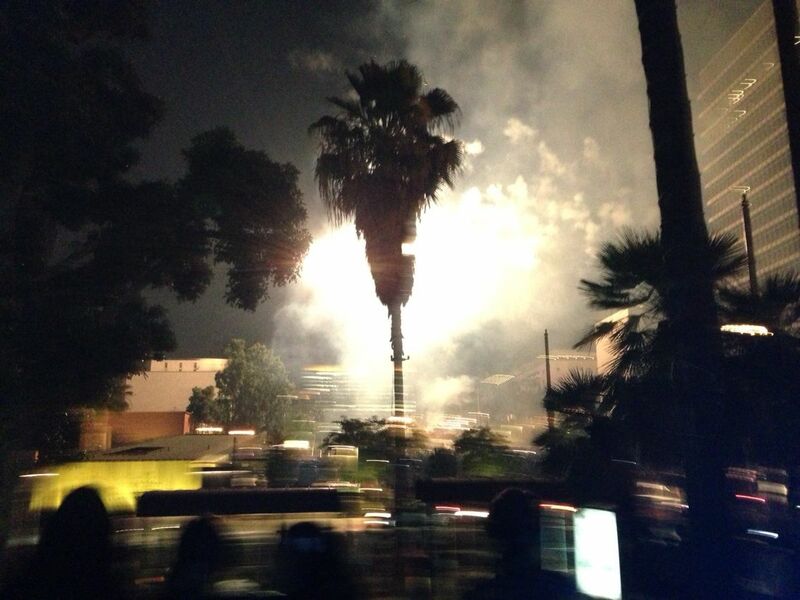 Besides, the girls were in the middle of one of their movies and while they wanted the fireworks, they did not wish to leave before the film’s end. The event that intrigued us the most was the fireworks show and block party at Grand Park across from Los Angeles City Hall. So at 6:00, we piled into the car and drove downtown. What we saw made my heart sing: Thousands of Angelenos — families, couples, young and old — were gathering downtown to listen to music and celebrate the founding of our nation. In downtown Los Angeles. I’ve written quite a bit over the last couple of years about the new energy in the heart of the city, thanks to a new population of urban residents who are finally making downtown a neighborhood again. But we did not stay very long. We were famished and could not find the food trucks we expected (just one serving ice cream and another with kettle corn). So we walked a few blocks south to the Far Bar in Little Tokyo, where we enjoyed a very nice dinner… interrupted by the sound of fireworks (way earlier than the 9:00 PM start time listed on the LA Times blog). We finished our meal and headed back to City Hall, just in time for the finale, accompanied by the Star Spangled Banner and America the Beautiful. I glanced at the time: It was 8:58. But at least, we got to see a bit of the show. And as we drove along the 101 back to the Valley, we got to see quite a number of pyrotechnic displays throughout the city. Next time, maybe we’ll just get in the car and drive. I wondered how the grand park event would be. too bad the time was wrong. I like that space and find downtown so much easier to deal with these days. So, next year go eat dinner at 7 and then walk over. Anytime I hear food trucks I ignore. There are never enough, the lines are long and most are not very good. Yes, I think I’m over the novelty of food trucks — but with three teenagers with differing ideas of what’s good, they’re an appealing option.